The Outdoor Combi Standard COD C3 is a condensing, floor-standing, Combi oil boiler that has been designed and manufactured by Mistral. This highly reliable boiler, provides full heating and instant domestic hot water at an efficiency level of 92%, making it an A-rated boiler, to help save you money on your energy bills. An output rating of 26-35kW and a flow rate of 17 XXL will all help to meet the heating and hot water demands of your home. Some of the features of this Mistral range include a fully-insulated, weather resistant casing that has been zinc phosphated to give the unit maximum protection from corrosion. In addition to this, a polyester coating, in a durable green texture finish, naturally blends the unit in with the surroundings. To ensure that the boiler will be working during the winter, it features a frost stat, protecting the boiler from the coldest of temperatures. There’s also a multi-directional flue, pre-punched pipe with entry points from the back and both sides of the unit and with it being a standalone unit, the installation will be quick and easy. For added protection, the unit has a lockable cabinet door and when it comes to the annual service, the heating engineer won’t need to access the residential area of the property. In addition, the unit has no internal oil line and is available to be used in tandem operations. 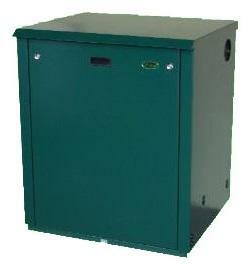 This unit is also available as a condensing or non-condensing boiler, to meet the needs of just about any home. Backed by the Mistral guarantee of quality, you’ll be covered by the manufacturer for 2 years on the parts and 5 years on the heat exchanger.